Conventional DBF to MySQL converters often lack accuracy and backward compatibility. Slow, resource-hungry and providing inconsistent quality they can cause a lot of trouble. For instance: broken DBF structure, truncated fields, incomplete export of larger files and many other issues. Not to mention time wasted on such erroneous conversion. Now look. There is a simpler option to transfer data from DBF databases to MySQL. 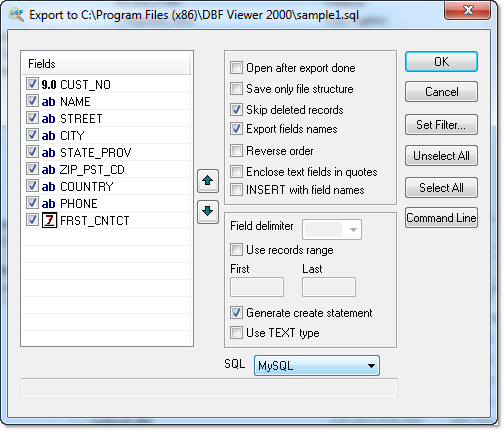 You need DBF Viewer 2000, a tool that encompasses virtually everything you need to work with the DBF format. And that includes DBF-to-MySQL conversion too. Second, you specify the output .sql file. Then, DBF Viewer 2000 reads the source DBF, displays a preview and allows you to adjust exporting. Now, what about automation? Even better, you can run conversion using the command line executions and specify all the required options using the below command line parameters.